With the European Central Bank (ECB) interest rate decision, monetary policy statement and governor’s press conference coming on Thursday, the Single Currency is succumbing to US dollar strength, as are all the other majors. This might give Mario Draghi and his team some comfort, and even a little more room for manoeuvre. 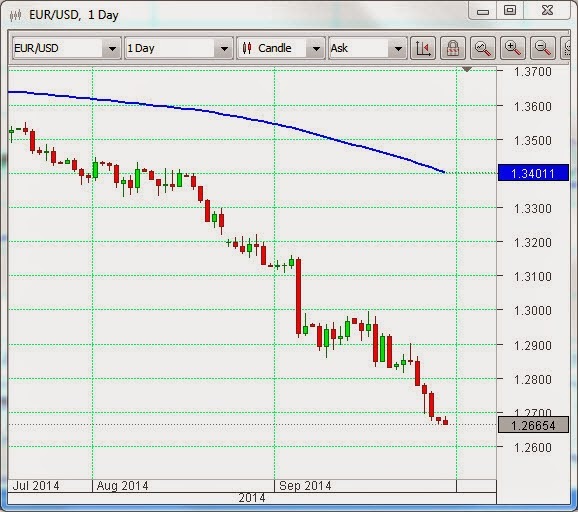 The pressing concerns of the ECB are the deflationary tendencies in the Eurozone countries. A weaker Euro is consistent with a rise in inflation, even if it is not to the liking of citizens, who have to pay more for what they buy from abroad and get less value when they travel to non-Euro regions. 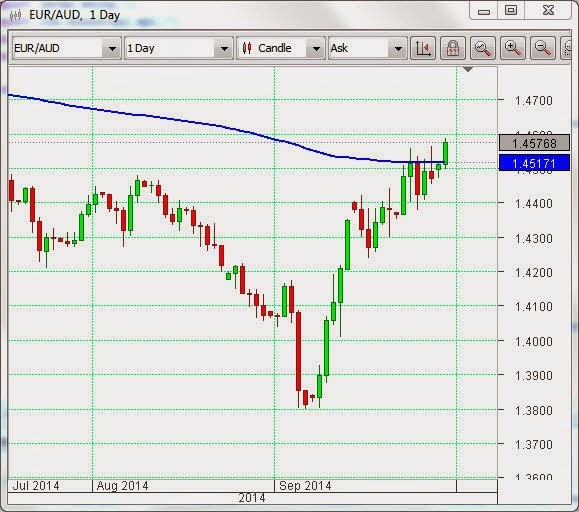 In the chart above, a rise in EUR/AUD means relative weakness in the AUD (Australian dollar). Now this pair has broken through its 200 day EMA (blue line). After many months of attempting to talk down the currency (“jawboning”, as they call it Down Under), the governor of the Reserve Bank of Australia, Glenn Stevens, must be quietly content with the trajectory of the Aussie at present. Something of a perfect storm has hit the currency – US dollar strength, as alluded to above; a definite softening of the Chinese economy, which has been very good to Australia for many years; a consequent collapse of hard commodity prices, especially Iron Ore; falling employment and now a dismantling of the Carry Trade, where investors chase yield in high interest rate jurisdictions to set against money borrowed in those countries that have lower rates. Once this last process starts it becomes a self-perpetuating one, as a drop in the value of the higher rate currency is bad for Carry Trade profits, so the institutions get out, fast. Even the success of their neighbours in New Zealand, in reducing the value of the Kiwi, is tending to drag the Aussie down in sympathy. Rather belatedly, the RBA, in conjunction with the mortgage regulators in Oz, have begun to consider so-called macro-prudential measures, or restrictions on borrowings for real-estate purchases, in order to deflate what is looking more and more like a property bubble. This, too, is seen as a negative for the Australian unit.